In celebration of its 100th birthday, Pinehurst introduced the No. 8 course in the spring of 1997. Designed as a modern-day version of No. 2, The Centennial-Pinehurst No. 8 is solid, straightforward golf, void of artificial earth movements and difficult forced carries. Pinehurst No. 5 provides more water hazards than any other course at the Pinehurst Resort. There's a pond just short-left of the green to the par-five third hole. There's a lake behind the green of 10 and a pond short-right of the 11th green. No. 6 at Pinehurst opened in 1979, and quickly earned a reputation for being one of the most challenging layouts in the area. No. 6 from the back tees, the general consensus went, was the hardest course in Pinehurst. By far the tightest course at Pinehurst, No. 3 is snugly enveloped with woods and water. A two-iron hit straight here is far better than a driver sprayed. The greens are small, putting even more premium on accuracy, and the ridges and hollows around them resemble those on No. There are many unique and interesting touches on the No. 7 course. There's the "Devil's Gut," a large expanse of wetlands on the short, par-four, seventh that your approach must clear. There's the double-dogleg, par-five 12th with an elevated green surrounded by trees and underbrush. Pinehurst's No. 2 Course is considered the resort's centerpiece and one of Donald Ross' greatest masterpieces. The course has been host to more single golf championships than any other course in the country and Jack Nicklaus has even said that it's his "favorite course from a design standpoint." When the course was completed in 1907, Ross called it "the fairest test of championship golf [he] has ever designed." Pinehurst Resort & Country Club - No. 9 (formerly known as National Golf Club) is a resort club that features a very challenging, but fair, layout designed by Jack Nicklaus. The course showcases rolling hills, surrounded by magnificant tall pine trees and an abundance of lakes. No. 4 at Pinehurst was originally designed and built in 1919 and was revamped by Robert Trent Jones in 1973. The course features lake holes and trecherous bunkers requiring both length and careful shot preparation on many of it's classic holes. #1 at Pinehurst Resort & Country Club is the Grandfather of all the Pinehurst Resort courses, designed by Donald Ross and coming up on it's centennial anniversary. Some of the holes on this course go back to the beginning of Pinehurst. Anchored by the Village of Pinehurst, the Sandhills region of North Carolina is made up of a collection of small towns and blessed with a sampling of public-access golf courses that many golf aficionados consider to be among the best in the world. The "Village" is home to the venerable Pinehurst Resort and Donald Ross' vaunted No. 2 course. The entire area oozes with layouts from Ross, Dan and Ellis Maples, Rees Jones, and Robert Trent Jones. This collection of golf courses comes together to produce one of the most unique golfing experiences on the planet. Just driving into and around Pinehurst is a surreal undertaking that every serious golfer must experience at least once. The thousands of long leaf pines outshine their scrubby, coastal cousins as they tower over the area's more than 40 golf courses. On a sunny day -- which there are plenty -- the light green glow of the pines and the blazing white reflection of the sandy soil come together to produce aura unlike anywhere else in the world. The Village is the centerpiece of this hedonistic existence, and driving through its winding, canopied roads, you are treated to a rare blend of New England architecture and old South charm. It all started back in 1895 when Massachusetts' James Walker Tufts bought up some land near the center of the Village for a dollar an acre. His plan was to create a health resort for wintering New Englanders. Legendary landscape architect and city planner Fredrick Law Olmstead designed the winding roads and public spaces of the Village, and Ross arrived on the scene circa 1900 to build Pinehurst No. 1. Today, Pinehurst is golf first, everything else second. Spring and fall are the peak seasons in Pinehurst, but golfers are welcome anytime of year. The summer brings long, hot days and some incredible stay-and-play deals with local resorts. The winter brings empty fairways and warm nights by the fireplace in some cozy resort. At the center of it all is the Pinehurst Resort. Your first glimpse of its whitewashed clubhouse will bring chills to your spine. Gaze out upon No. 2's 18th fairway and envision Payne Stewart and Phil Mickelson striding up to the green during the final round of the 1999 U.S. Open. Whatever you do, lose yourself in time and space and focus only on the golf at hand. Depends on whom you ask. Pinehurst is a resort and an incorporated village, but the term "Pinehurst" is often used generically to describe a region of south, central North Carolina known as the Sandhills. Pinehurst, the resort, is a wonderful collection of historic hotels and eight world-class golf courses that is widely considered one of the top golf destinations in the world. Pinehurst, the Village, is a quaint New England style town founded by Boston business mogul James Tufts and designed by legendary landscape architect Frederick Law Olmstead. The surrounding area - the Sandhills - is inclusive of the Village of Pinehurst and the Resort, but also includes the neighboring towns of Aberdeen and Southern Pines. Part of the frustration of getting to the Sandhills is also part of the charm. The area is not connected to the rest of the world via the Interstate system and is served by a diminutive airport with limited commercial service. Three major metropolitan areas, however, are just a short car ride away from the center of Moore County. Raleigh and Greensboro are approximately one-hour northeast and northwest, respectively. And Charlotte, the Carolinas' largest city, is two hours west. From Raleigh, the best approach is south via Highway 1, from Greensboro use a combination of Interstate 73/74 south and Highway 211, and from Charlotte take Highway 74 east to Highway 220/1 and head north. What can I expect, in terms of golf? In short, one of the best collections of resort, semiprivate and daily-fee golf courses in the world. Pinehurst Resort is home to eight highly rated tracks, including Donald Ross' legendary No. 2 Course and the picturesque No. 4 Course. Outside of the resort, one of the most popular stops for traveling golfers is Southern Pines where the Mid Pines Inn and Golf Club and the Pine Needles Lodge and Golf Club await with traditionally designed Ross layouts. What kind of weather can I expect, and when are the peak seasons? The Sandhills are blessed with some of the best inland temperatures in the Carolinas. Summers are quite warm, but tolerable because the sandy soil cuts down on standing water and overall humidity levels. The fall is perhaps the best season of the year, with its warm, sunny days and cool, crisp evenings. Golfing through the winter months is totally feasible, as daytime temperatures in January and February climb into the low to mid 50's. Winter is also the best time to snare blue plate specials at the Sandhills' top golf courses. Spring is the Sandhills peak season, so make your reservations well ahead of time. The azaleas and dogwoods come into bloom and temperatures return to the 60s, 70s and even 80s. I am bringing my spouse and children and they don't golf. Is there anything else to do in the Sandhills? First-class shopping abounds in the Sandhills and is centered on the numerous specialty shops of the Village of Pinehurst. The area is widely regarded as an antique shopping mecca and the mini mall inside the old Theatre Building is one of the most popular shopping draws in the region. Historic Downtown Southern Pines features an incredible display of trees, flowers and courtyards graced by specialty shops, galleries and cafes that provide a quaint village atmosphere. Downtown Aberdeen is a North Carolina "Main Street" community with an historic district featuring antiques, collectibles, handicrafts and unique gift boutiques. What kind of dining options should I expect? Restaurants run the gamut in the Sandhills, from casual to fine dining. Part of the Pinehurst/Sandhills experience is playing an invigorating round of golf, freshening up a bit, and then heading off to one of the local pub-like eateries in the Village. Dugan's Pub is a convenient place to grub up. Just like some of the area golf courses, Dugan's Pub has two totally different sides. Upstairs is the restaurant where formal dining reigns supreme. Downstairs is a good old-fashioned bar. For dinner, the Pinecrest breaks out a couple of formal dinning rooms that can hang with the best in the area. The supper fare is upscale, including button mushroom appetizers, rack of lamb, prime rib and filet mignon. If you are in town alone, the bar is an excellent place to meet like souls and enjoy a pint or two. The Sandhills banks on its originality, not mass production, and when it comes to food, golf and accommodations, the region does not disappoint. 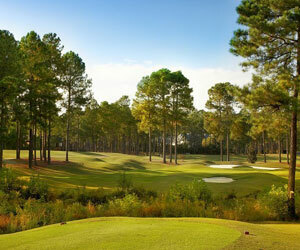 With nine golf courses, it's tough to play all 162 holes on one vacation to the Pinehurst Resort in North Carolina. Brandon Tucker provides a snapshot of the nine courses at the resort, including world-renowned Pinehurst No. 2, which may help you narrow down which to book and which to set aside for another trip. The No. 1 Course at Pinehurst Resort officially dates back to 1898, when it was built by Leroy Culver. But the initial course was altered and enhanced when Donald Ross moved to the resort in 1900. Today, it has three sets of tees and plays as long as 6,093 yards and a par 70. The course begins with a downhill, dogleg left par 4 that plays across the street from Pinehurst's equestrian club. It finishes with a small par 3 that plays back towards the clubhouse. Pinehurst No. 2 is back -- in a big way. After spending much of 2010 under the knife, the 2014 U.S. Open host has reopened with a brand new, sandier look. The renovation of Donald Ross' masterpiece was put in the hands of Bill Coore and Ben Crenshaw. The two spent a lot of time looking at former pictures and blueprints of the design and did their best to restore it to its sandier state. Pinehurst No. 4 feels more contemporary than a typical 1919 venue - no accident after Tom Fazio's dramatic reconstruction of the classic golf course. No. 4, based out of the main clubhouse alongside four other Pinehurst layouts, re-debuted in 2000. It preserves much of the original routing plotted by Donald Ross while adding modern challenges, Brandon Tucker writes.